“Non-Knowledge, Laughter and the Moving Image” is a three-year artistic research project led by Prof Annika Larsson and realized in collaboration with HFBK Hamburg and the Royal Institute of Art Stockholm. Your research project combines three very unconventional terms, which is laughter, the moving image and non-knowledge. What is meant by each individual term and how do they relate to each other? The whole project started with the text “Non-knowledge, Laughter and Tears” by Georges Bataille based on a lecture he did in 1953 and where he states that “knowledge demands a certain stability of things known“, whereas “the laughable always remains unknown, a kind of unknown that invades us suddenly, that overturns our habitual course”. Bataille suggests that, “the laughable is not only unknown, but unknowable”, and means that without this sudden invasion of the unknown, one cannot create new thought, nor change anything. Laughter has not only the ability to shatter familiar thoughts, but also the ability to basically turn the world upside down (and shatter official truths). One might say that it builds its own world versus the official world. In that way laughing can have a political potential, be a resistant gesture and queerify the production of knowledge. No dogma, no authoritarianism, no narrow-minded seriousness can coexist with laughter. In many ways the moving image functions in a similar way, in that it has a capacity to build its own world – another time-space that opens up a virtual space in where it becomes possible to visualize another possible thought. Far from being a mere representation of the real world the moving image has an ability to directly act upon us (and our consciousness). It is an active force that changes us as well as the world. So with the moving image you can enter really interesting discussions around what we call real or alive and what we call dead. One common idea is to think of the image as dead material. In my approach of film making or video art I see the image as something highly alive, something that is a player among other players. I am very interested in this feedback relation between images, humans and the world, and how with the mass introduction of cinema at the beginning of the 20th Century our way to perceive the world and ourselves radically changed, and how it keeps on changing with new technology. As Walter Benjamin asserts in his seminal text “The Work of Art in the Age of Mechanical Reproduction” it is through the camera that we first discover the “optical unconscious”, just as we discover the instinctual unconscious through psychoanalysis. There is a strong connection with these two types of unconscious, which brings the moving image and laughter into a close bound. The effect that laughter produces in us, a feeling of being thrown “out of joint” and “beside ourselves” also happens when the viewer is confronted with the close-up or an unexpected meeting of two conflicting shots in a moving image. Filmmaker and film theorist Sergei Eisenstein has described this psychological effect that forces the viewer to go out of a normal state, into a pre-logic, irrational state, of “pure” affect, feeling and sensation, as something that forces the viewer to jump out of his seat, into a point of ecstasy, which literally means out of state. So, one of the questions this project is asking is whether these moments of becoming “beside ourselves” perhaps could lead to more social, dependent, and relational modes of existence. So does non-knowledge only have positive aspects? There is also a less positive side of non-knowledge that is very relevant today, especially if we look at digital culture, and the new developments of data collection, big data and aspects of automatization. There is simultaneous growth of knowledge and non-knowledge. On one hand live with an abundance of knowledge, but at the same time there are mechanisms of control that hide data from us or hide the mechanisms themselves. The same mechanisms also force us into states where we have less control or no control. I think it is extremely important for artists and image producers to try to get behind those structures of control in order to gain knowledge of who is programming our new worlds, especially in order to create alternatives. Our digital society also forces us to behave more and more predictably and controlled, which is why one could say there is also an urgent need for unpredictable behaviour and moments of loss of control. This project wants to explore if laughter or the moving image could create those moments, to help us off this predictable path, so to say. Another point with data collection is of course aspects of privacy, which is one of the central questions in the first video I am producing in the context of this project. In this work I am interested in how todays immersive and interactive virtual reality (VR) technologies are as much about collecting information about our movements and affects as they are about immersing us into a virtual world. Similar to cinema and other moving images VR-technologies not only show us a new world but simultaneously also control and regulate our impulses, emotions, and consciousness, which make it a technology with two sides – one that could open us up for control and manipulation but that at the same time could expand ideas we have around the self, our bodies and perceptions of reality. What forms will your research project take? 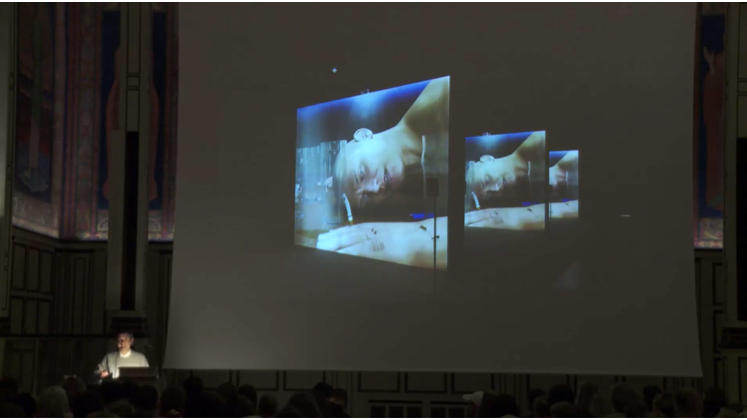 As a kick-off event you invited Ed Atkins for a lecture. What does his work have to do with your topic? Ed Atkins is interesting because he connects the digital sphere with the dead body and he asks questions around the body-less virtual space. For me, his works also inherit an interesting paradoxical quality. He has an interest for the digital image as a corpse, but at the same time he brings dust, biological and analogue things into this digitally cleaned programmed space, which also makes the images highly alive. He is also subverting the conventions of moving images and reflects on digital media and the fundamental changes it has brought about in our perception of images and our own selves, something this project is also interested in. 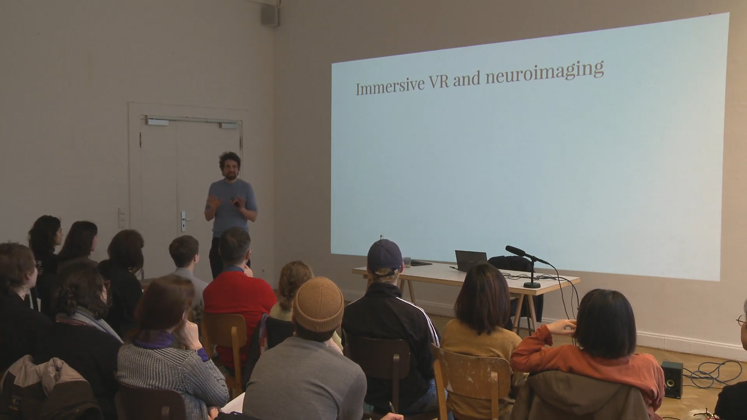 In January I invited Dr Michael Gaebler, a brain and cognitive scientist who held a talk and discussion around VR and the brain. For me it is important not only to bring in people from the arts but people from different disciplines, to stimulate a discussion. For April I have invited another artist, Marianna Simnett, who will give a talk on her practice. Although the projects main aim is to explore the moving images as a form of experimental thinking, these talks and discussions serve as an important part which also arises from a longing I have had for creating contexts and discussions that expand and relate to my own artistic practice, situations where dialogue and exchange can take place. I guess that is also what has brought me to teaching.